Returned home today to find my favourite kind of post – ok, second favourite kind of post – a “Sorry you were out card” from Royal Mail. I have a package!! Wheee! But I know not what it is… is it the cashmere cone I got from Colourmart… or the sample cards I ordered from Fleece Artist? Or Cherry Tree Hill? Or Shelridge Farm? oooh so exciting. 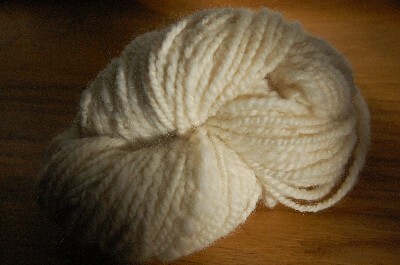 I plied some of the spindle spun merino (oops, not BFL as I had thought. My lawyerly (lack of) attention to detail never ceases to astound me). It’s only 26 grams, but I love the way it looks. Washed it last night to set the twist, and dried it over the bath. I think a proper spinning wheel is on the cards for me – I am crap at resisting temptation, and it’s just too damn slow on a spindle. 26 grams!! And though Knitty’s Handy Plying is fab, it’s also slow and not all that fun. 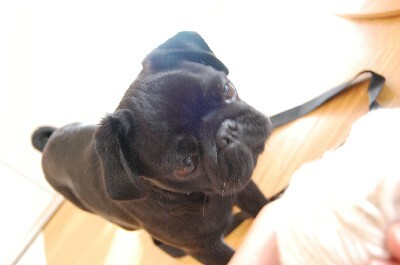 Your puppy is so cute. As for spinning, I could get the bug, but how bulging would my closets be then? Yoshimi! I’ve already booked my rooms for the woolfest! Will you be there? It would be so awesome to meet up. Coffee and yarn drooling for sure! And the little black joker will be in tow. That dog is fantastic!Your spinning looks great too! I think it is in the cards for me too. Deuce is gorgeous!Spinning is something I just can’t seem to get the hang of so I’m totally in awe of anybody who can, go for it! Oh, I do love a good package. And the anticipation is (almost) as good as the package itself! Great spinning – you really need a wheel! 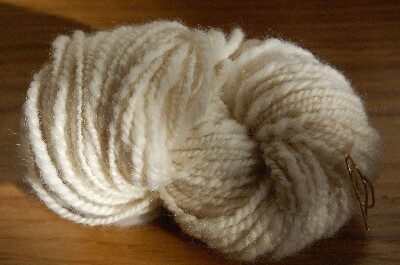 I’ll be at Woolfest too with a couple of friends – I’ll be drooling over roving!